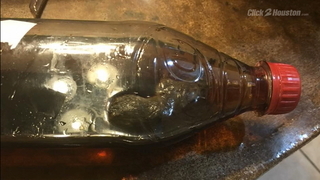 A Katy grandfather is searching for answers after he said he found a dead rodent inside his grandson’s bottle of Dr Pepper. John Graves of Katy said his 3-year-old grandson, Kayden, drank the Dr Pepper on Sunday after they bought it in Galveston. The boy was given the soft drink while he sat in his car seat. He didn’t finish it, so they put the cap back on. When they opened the 20-ounce bottle the next morning, they found a rodent floating inside. “Pretty good size. About 3 inches long, with a big tail,” Graves said. They immediately took Kayden to his pediatrician to undergo some tests. Blood and urine samples were taken, and the state of Texas and the Centers for Disease Control were contact. They are now waiting for the results. Fortunately so far Kayden appears happy and healthy. “I’m concerned about the health of my grandson,” Graves said. The family also contacted Dr Pepper. A spokesperson told them and KPRC 2 that they want the bottle so they can run tests on it. But the Graves family wants to have its own testing done before handing the bottle over to Dr Pepper's people. As of Tuesday, the family was working with Dr Pepper to figure out if the rodent could be sent to an independent lab in Houston. Dr Pepper tells Channel 2 it would be happy to send the rodent to a qualified lab in Texas; however, at this point the only qualified lab the company is aware of is Alteca LTD in Kansas. The family told KPRC 2 it may contact a lawyer and will work with Dr Pepper to figure out what the next steps are. The owner of the Galveston store where the soda was bought told Channel 2 that all of its bottles come sealed -- and if anything was inside, it came from the manufacturer. But a Dr Pepper spokesperson says it's virtually impossible for something to get into one of its bottles. "We have offered to dispatch a courier to pick up the product to take it out for testing by a third-party forensics laboratory, but the consumer has declined this request. This lab would be able to analyze any rodent that got into the product, determine how it entered the container and even inspect the contents of its stomach. This process can take 6-8 weeks to yield conclusive findings. Until we have the opportunity to review the contents, we don't have a way to do a full investigation." He said it’s not common for consumers to see something like this in a product because of so many checks and balances in the system, and due to the speed at which products are packaged. “It’s washing the bottle, it’s filling the bottle, it’s putting the cap on the bottle, it’s putting the label on the bottle, all in less than 15 seconds,” Neal said.